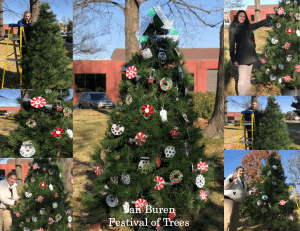 The Van Buren Chamber of Commerce is celebrating their annual Festival of Trees – Saturday, December 1st. The event will be held in conjunction with the lighting ceremony at the Crawford County Courthouse and The Old Town Merchants Association’s “Living Windows”. For more information about the Festival of Trees, check the Van Buren Chamber of Commerce’s website.